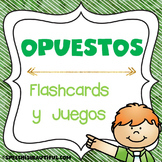 17 pairs of opposites in color and b&w bilingual flashcards. 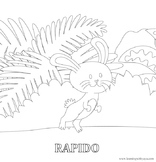 Students can use the b&w to create an opposites book. 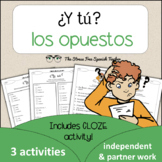 Worksheets to complete, finding the opposites in Spanish. 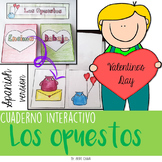 Bilingual memory game cards in color. Puzzle pieces to match the opposites. 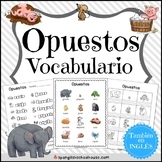 This is a board game in which students will see an affirmative or negative word in Spanish written in the space and the student must give the Spanish opposite. Included are 6 game boards in different colors, a spinner to make, a sheet where students can write down their answers, and an answer key.